﻿﻿As a passionate lover of fashion, art, and design in all its guises, to my way of thinking, the only thing better than something that combines fashion, art, and design, is one that is for a good cause. 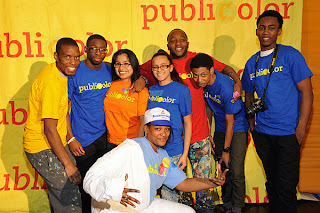 This pretty much sums up Publicolor (www.publicolor.org), the non profit organization which was founded in 1996 by Ruth Lande Shuman. It's mission: "To counter inner-city public schools’ alarming dropout rate by engaging disconnected youth in their education through a continuum of design based programs and academic support. It directly addresses two of the root causes of poverty in America: the under-education of inner-city public school students and their lack of preparedness for the workforce. Central to their mission is the "beautification and revitalization of public and civic spaces through the affordable medium of paint and collaborations that students and the community as a whole." Publicolor's most important fundraiser is their annual "Stir, Splatter and Roll" gala, which took place last night at the Martin Luther King Jr. High School, fittingly located right behind Lincoln Center (it's a Publicolored school of course). Even by New York's standards, this is a unique party, where guests, including high profile, civic minded New Yorkers representing the worlds of business, fashion, politics, design, education, and philanthropy, (Sherry Bronfman, Hannah Bronfman, Doria De La Chappelle, Kyle DeWoody, Mark Di Suvero, The Honorable Robert Doar, Councilman Robert Jackson, Commissioner Raymond Kelly, Harold Koda, Charlotte Neuville, Stan Herman, Renee & Jeremy Saltzman, Robin Swid, Nan & Steve Swid, Pat Schoenfeld, Perri Peltz & Eric Ruttenberg, Lizzie & Jon Tisch, Leila & Massimo Vignelli), are asked to "dress in colorful and festive attire" and paint alongside some of the city’s leading artists, designers and architects. Over one million dollars was raised last night and all proceeds will go to Publicolor's mission to "engage disconnected students in their education, while teaching them strong and transferable work habits so they are prepared to be productive in both college and career." 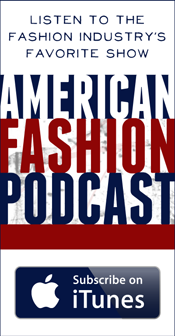 This year, the co chairs were Fern Mallis, the Creator of New York fashion week, and the designer Michael Kors. 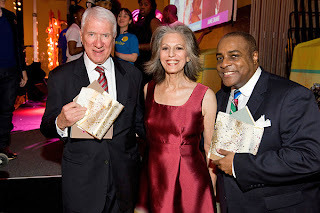 Honorees were award-winning fashion designer Jeffrey Banks and renowned architect Gene Kohn, both leaders in their fields and huge Publicolor supporters. The evening began with cocktails and painting. Tyvek jumpsuits were provided for guests who wanted to paint limited edition pillows alongside notable artists and designers (there were 18 different stations set up) including Nicole Miller (her theme was flowers) and Milly's Michelle Smith (whose theme was geometric patterns). At Michael Kors (Michael could not attend, but his design team was on hand), the theme was graphic black & white animal patterns. All the paint used was donated by Jacquard Paint. At the end of the evening, these pillow covers were for sale at $100 each, along with Silent Auction pillow covers designed by a group that included Angela Cummings, Carlos Falchi, Michael Kors, Betsey Johnson, Tommy Hilfiger, Oscar de la Renta, Kenneth Cole, Cynthia Rowley, Elie Tahari, Jonathan Adler, John Bartlett, Stan Herman, Tracy Reese. A seated dinner was held in the school's vast auditorium, which was wonderfully transformed in keeping with the festive and colorful theme of the event (fyi, even the restrooms were filled with colorful artwork). Ruth Shuman came onstage to make her welcoming remarks during which time she shared some powerful statistics- proof of the amazing success rate her organization continues to have when it comes to turning the lives of young students around through art. Simon Doonan was the Emcee and was his usual comical, entertaining self. But he was quite serious when it came time to speak about Publicolor. "We're all so happy to be involved with this organization which teaches students to develop creativity, and has provided the wonderful opportunity to turn adversity into creativity. Each and every one of us has a chance to be a mentor...to give these children a brighter future". He introduced the two honorees: Jeffrey Banks, who brought his beautiful 92 year old mother to the event (she still drives, is quite a dynamo, and looked amazingly chic in her Manolo Blahnik pumps), and Gene Kohn who noted, "what Publicolor does is important to us and to all these kids. But the Award should really go to Ruth". By the way, among my table mates Scott Bromley, the architect who designed Studio 54, veteran jewelry designer R.J. Graziano, (who was proudly describing his fall collection, comprised of chic oxidized metals and spikey necklaces), and the very busy Fern Mallis, who just back from another one of her exotic trips abroad. 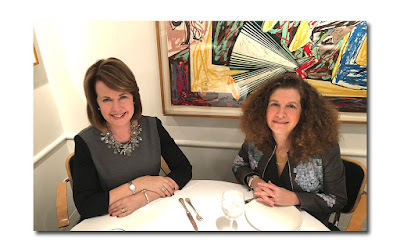 Fern's next interview, (as part of her very popular Fashion Icons with Fern Mallis lecture series for the 92nd street Y), will be with The International Herald Tribune's Suzy Menkes, on Tuesday, May 7th. When I asked her which designers from the past, she would have most liked to interview, she quickly rattled off: "Pauline Trigere, Bill Blass, Halston". Knowing Fern, don't be surprised if she somehow makes it happen.